An American inventor and a savvy businessman, who invented the incandescent electric light bulb and the phonograph is none other than Thomas Edison. A man who contributed a lot in the field of science & technology and gave birth to many devices in the fields such as electric power generation, mass communication, sound recording, motion pictures and many other. On 11th February 1847, Thomas Alva Edison was born in Milan, Ohio, United States. He was the youngest of the seven children of Samuel and Nancy Edison. His father, Samuel was an exiled political activist from Canada and his mother Nancy Edison was an accomplished school teacher. Edison was diagnosed with scarlet fever as well as hearing disabilities at a very young age and nearly deaf as an adult. In 1854, his family moved to Port Huron, Michigan where he attended public school for 2-3 months. His teacher titled him as a hyperactive child, prone to distraction. Then after his mother pulled him from school and started his schooling from home. At the age of 11, he showed a hungry appetite for knowledge, reading books on a wide range of subject. During this age he Thomas Edison developed a process of self-education and started learning independently. At the age of 12, Thomas Edison published his own small newspaper, “Grand Trunk Herald”. He also started conducting chemical experiments in a small laboratory that he set up at train baggage car. At the age of 22, in 1869, he moved on to New York, and there he developed his first invention, an improved stock ticker called the Universal Stock Printer, which synchronized several stock tickers’ transactions. In 18877, he developed a method for recording sound; the phonograph. Thomas Edison married a 16-year-old Mary Stilwell, in 1871, who was an employee at one of his business. He had three children Marion, Thomas, and William. At the age of 84, on 18th October 1931, Thomas Edison died in his home, at Glenmont, in West Orange, New Jersey. People in different countries dimmed their area & home lights or turned off their electrical power to commemorate his passing. Thomas Edison a man who endured until he achieved success, and he didn’t stop until he got what he wanted. Most of us give up in life when it seems failure all around and no hope. But Thomas Edison was a man of hope & strong belief & determination. He continued the race of life and never gave up in life. His words proved us that we should be courageous & intrinsically motivated in life to win each & every race which may come up. 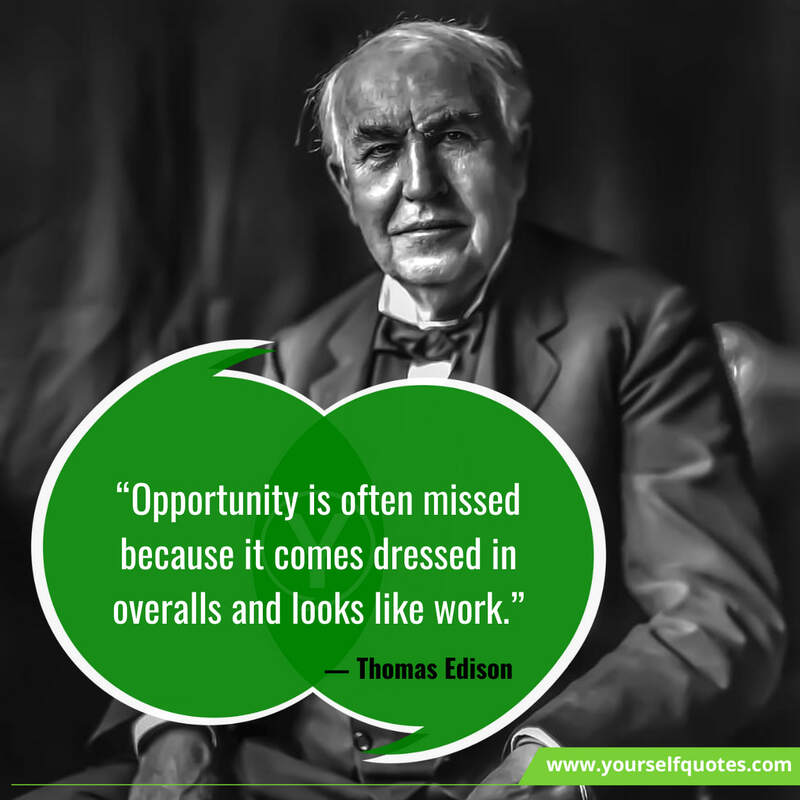 Share out the most motivational Quotes by Thomas Edison that will motivate you intensely and will become an inspiration for others only from Yourself Quotes.